When I was pregnant with Aimery, I was pretty certain that I was going to exclusively breastfeed. I had given how I wanted to feed my baby some thought, and I felt like pumping just wasn't for me. It wasn't until a few weeks before my due date that I thought it may be a good idea to have a breast pump on hand; just in case I changed my mind about pumping (which worked out great because it was better for me personally to exclusively PUMP!). I tried to contact my insurance so I could try to get myself a free breast pump, and it was sooo difficult. I ended up giving up because it became too stressful. Being pregnant is stressful enough without having to worry about getting a free breast pump! This is why I am so happy that I recently discovered Bump Benefits. Bump Benefits helps new and expecting mothers receive a free breast pump through their insurance-covered benefits. Bump Benefits works directly with your insurance company on a mother's behalf to verify your eligibility and handle all of the paperwork, claims, and billing details. Only a few days after qualifying, you'll get your breast pump shipped to you for free! I used the Medela Pump in Style Advanced while nursing Aimery. Check out all of the Bump Benefits breast pumps here. Bump Benefits gives you many breast pumps to choose from, some of which include: Medela Pump in Style Advanced (I used this one and loved it), Spectra, and Ardo Calypso. 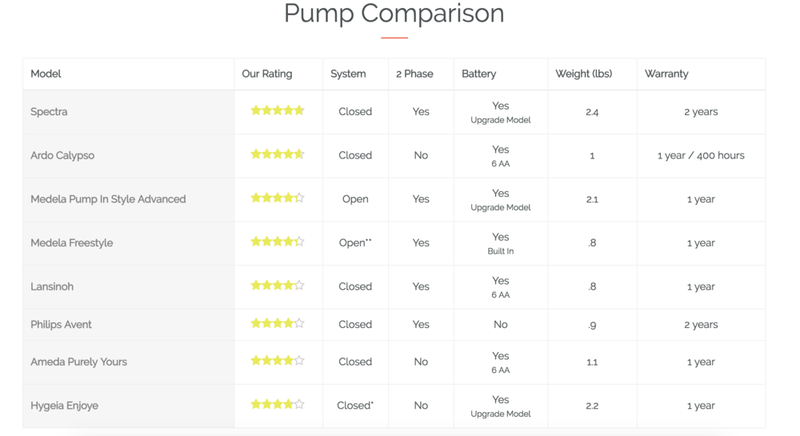 They do the research for you by rating each pump on a 1-5 scale for performance, portability, acoustics (including a recording of what it sounds like! ), hygiene, and accessories. They write pros, cons, and a short bottom line so you can have all the information you need in under a minute! All you have to do is choose the one that works best for your lifestyle! There are several 100% free options, and some higher-end options that you have to pay a small fee for because insurance won't cover the whole cost. Once you submit the necessary paperwork and select a pump, you'll get your insurance-covered pump sent to you, 100% free. It normally takes 1-2 business days for Bump Benefits to complete the paperwork (like verifying your benefits) and send out the pump. However, sometimes insurance companies have different regulations about when the pump is allowed to be sent out, and in that case Bump Benefits will contact you about when you will be able to receive it. Every breast pump is scored 1-5 on everything that you would ever want to know so you can pick the best breast pump for you! Why are the breast pumps free? Part of the Affordable Care Act, that was signed in 2010, states that health insurance plans are required to provide breast pumps in order to support nursing moms in the U.S.
You can read more about the Affordable Care Act (ACA) here. So then why is there a fee on some of the breast pumps? Every insurance company is different in terms of their breast pump benefits. Some insurance companies will cover basic models, where others will cover almost all of them. The good thing is -- as long as you're qualified to receive a free breast pump, Bump Benefits will make sure that you get a variety of models to choose from; they understand that different women need different breast pumps! Bump Benefits gives you all the information you need to decide which pump works best for your lifestyle. If you are an expecting mother unsure about whether or not you'll need a breast pump, I would encourage you to look into Bump Benefits today so that you will have all the information you need to make that decision. Bump Benefits makes it easy for you to get your insurance-covered breast pump 100% free! I have been sponsored by Bump Benefits for this post; however, I am sharing my own thoughts. All opinions are my own.